Abstract: Idiopathic pulmonary fibrosis (IPF) is the severest form of idiopathic interstitial pneumonia, with a median survival time estimated at 2–5 years from the time of diagnosis. It occurs mainly in elderly adults, suggesting a strong link between the fibrosis process and aging. Although chest high-resolution computed tomography (HRCT) is currently the method of choice in IPF assessment, diagnostic imaging with typical usual interstitial pneumonia (UIP) provides definitive results in only 55%, requiring an invasive surgical procedure such as lung biopsy or cryobiopsy for the final diagnostic analysis. Lung ultrasound (LUS) as a noninvasive, non-radiating examination is very sensitive to detect subtle changes in the subpleural space. 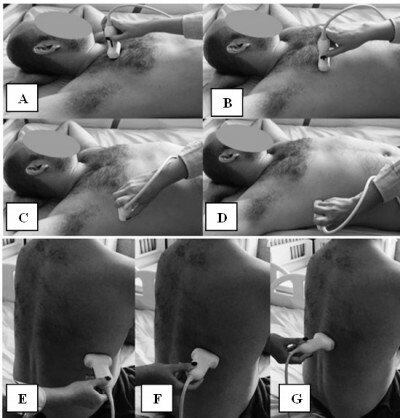 The evidence of diffuse, multiple B-lines defined as vertical, hyperechoic artifacts is the hallmark of interstitial syndrome. A thick, irregular, fragmented pleura line is associated with subpleural fibrotic scars. The total numbers of B-lines are correlated with the extension of pulmonary fibrosis on HRCT, being an LUS marker of severity. The average distance between two adjacent B-lines is an indicator of a particular pattern on HRCT. It is used to appreciate a pure reticular fibrotic pattern as in IPF compared with a predominant ground glass pattern seen in fibrotic nonspecific interstitial pattern. The distribution of the LUS artifacts has a diagnostic value. An upper predominance of multiple B-lines associated with the thickening of pleura line is an LUS feature of an inconsistent UIP pattern, excluding the IPF diagnosis. LUS is a repeatable, totally radiation-free procedure, well tolerated by patients, very sensitive in detecting early changes of fibrotic lung, and therefore a useful imaging technique in monitoring disease progression in the natural course or after initiation of treatment.